World Thinking Day: World Thinking Day is February 22nd. It's a day when Girl Scouts unite (in spirit) to celebrate sisterhood with Girl Scouts and Girl Guides around the world. The theme this year is "We Can Save Our Planet". 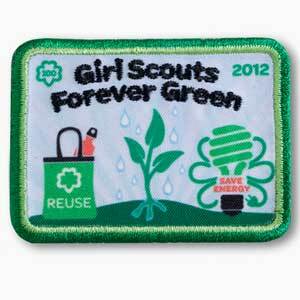 Girls can earn a patch (that goes on the front of the uniform) by completing one or more acitivities on that day. Each year on February 22, World Thinking Day, girls participate in activities and projects with global themes to honor their sister Girl Guides and Girl Scouts in other countries. World Thinking Day is part of the World Association of Girl Guides and Girl Scouts Global Action Theme (GAT) based on the United Nation's Millennium Development Goals (MDGs), which aim to improve the lives of the world's poorest people. 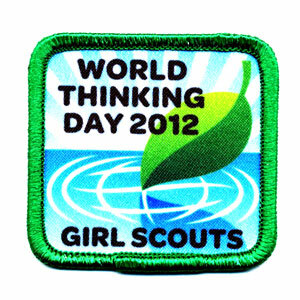 The theme for World Thinking Day 2012 is girls worldwide say "we can save our planet." World Thinking Day not only gives girls a chance to celebrate international friendships, but is also a reminder that Girl Scouts of the USA is part of a global community—one of nearly 150 countries with Girl Guides and Girl Scouts. On March 12th, 2012 the Girl Scouts turn 100 and ChiIL Mama will have a full feature, video interview and more. In the mean time, cookies arrived the 12th and are only around a month. So get your Thin Mint fix while you can! We'll have a big cookie feature up in the near future. We've got photo filled Brownie recaps from ice skating, The Chicago Wolves Girl Scout cookie kick off, and Chicago's own Journey world. I was a Brownie and Girl Scout as a kid, and now Sagezilla is a Brownie. Our family has enjoyed reconnecting with the Girl Scouts for the past 2 years. There are so many fabulous opportunities through scouting and we've had nothing but a great experience. We've been seeing a lot of wacky stuff recently....good, bad, and ugly. You decide. Should a dedicated troop leader be fired for ties to her husband's art & music blog? !